Jim has always teased me about my seismic hiccups. Their size was rivaled only by their duration. 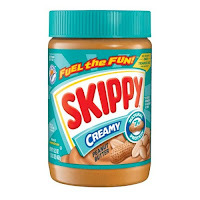 One day my office assistant mentioned that peanut butter worked as a cure, and she happened to have a jar in her purse. Since that miraculous advice, a big spoon full of peanut butter has never failed to drive away even my loudest hiccups. personally, i swear by a teaspoon of lemon (or lime) juice. Works every time for me and my nearly-four year old daughter asks for "hiccup medicine" when she has them. 1. Get a glass of water - 8-10 oz should do the trick. 2. While standing and holding the glass, bend at the waist as low as you can comfortable go (no gymnastics, just bend pretty low). 3. Slowly drink the water. You will probably find that the far end of the glass is more comfortable to drink from. Drink it all down. i recommend the whipped peanut butter! it is yummy!